Dimensions (HxWxD): 1.5" x 1.3125" x 0.375"
We will choose one of these fabulous pieces for you! These lovely & smoothly polished pieces of rainbow fluorite are perfect 'worry stones' or should i say not-to-worry stones! They are small enough for your pocket or to hold in your hand while meditating. It's also very useful to place on the body during a treatment or session with a client or patient. Each piece comes with a pouch in which to store this lovely crystal. I love these pieces of soft & smooth fluorite, i work with them on my body during Reiki self treatment as well as holding in my hand when I feel the need for extra energy. The colors range from purple and green with stripes of white and/or blue. Each one is a lovely little Universe! Note: Actual Average Weight is 23 grams. Each piece is unique and may vary slightly in appearance and dimensions from the picture here. 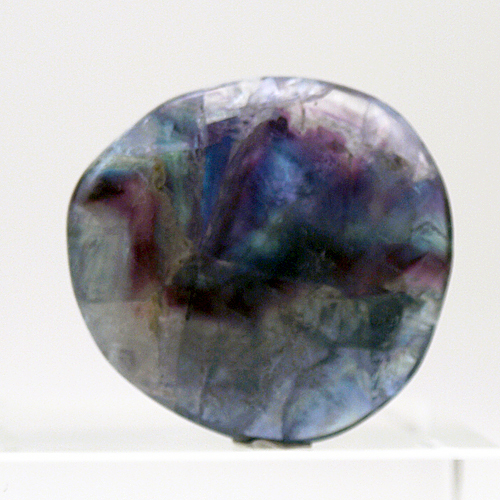 Each piece is guaranteed to be beautiful and to contain the main colors of fluorite in each specimen. Each piece is guaranteed to meet with your complete satisfaction!